Cruise ships are ﬂoating cities that generate enormous volumes of waste. Every day, a typical cruise ship generates 30,000 gallons of sewage, 250,000 gallons of graywater (wastewater from galleys, showers, sinks and laundry) and 5,000 gallons of oily bilge water. Sampling of cruise ship graywater and treated sewage has shown that these wastes contain high concentrations of bacteria, heavy metals, nutrients, and other pollutants. Bilge water, which collects in the bottom of ships, contains oil and chemicals from engine maintenance that are toxic to marine life. Cruise ships also generate significant quantities of garbage, which is burned in onboard incinerators, emitting toxic air contaminants. Furthermore, cruise ships burn huge amounts of dirty, tar-like bunker fuel that also pollutes our air. Each day in port, a single cruise ship generates air pollution equal to that of 12,000 cars. Santa Barbara hosted a record 29 cruise ship visits in 2014, up from just a handful in previous years. 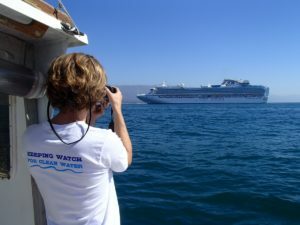 While some welcome the revenue expected from cruise ship passengers shopping and dining in Santa Barbara (estimated at about $92 per couple), others, including Channelkeeper, are concerned about the potential environmental impacts of this drastic increase in cruise ship traffic through the Santa Barbara Channel. Though existing regulations prohibit cruise ships from dumping any waste within three miles of shore, and the Santa Barbara Waterfront Department requires cruise ship captains to sign an “Environmental Declaration” promising not to dump sewage or graywater within 12 miles of the Santa Barbara coast, monitoring and enforcement of these provisions is extremely minimal, and the cruise industry has a checkered past when it comes to environmental compliance. To ensure that the increase in cruise ship traffic through the Santa Barbara Channel doesn’t result in increased pollution, Channelkeeper is monitoring cruise ships when they call on Santa Barbara, both from our boat and by plane, to ensure that they comply with the no dumping rules. Channelkeeper is looking for people with planes to help us with aerial surveillance. Please email or call us at 805.563.3377 if you can help!